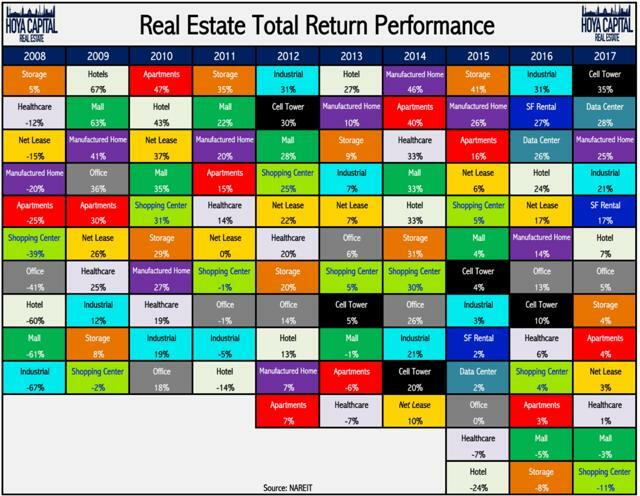 Not every REIT is equally opportunistic, and this is especially true when you consider that we are approaching the end of the current cycle. We are gradually shifting more and more capital from cyclical REITs towards recession-proof REITs to protect our capital and sustain our income streams. What type of REITs are we targeting in 2019? Such low unemployment rates are commonly achieved towards the very end of a cycle and shortly followed by a downturn. Almost all other market intelligence points out that our current cycle is already stretched and approaching its end. Most conference participants believed that we still have 1-2 good years before a slowdown in the global economy. The US tax stimulus boosted the current cycle, but the inevitable slowdown is only pushed forward by 1-2 years. The tight labor market, risk of inflation, trade wars, and growing populism are putting increasing pressure on the current cycle. The next downturn will come sooner or later, and it could come as early as 2020, according to many market experts. This does not mean that we should go all cash and wait around until it finally happens. But preparing for it is crucial to ultimately sustain as much value and income as possible. REITs (VNQ), as a whole, remain very opportunistic today, but we identify large disparities in fundamental strength, which will guide performance in the next recession. Our High Yielding REIT Portfolio is today already well-positioned with a sizable allocation to quality names, and as we move forward into 2019, we intend to continue shifting capital from higher-risk investments towards our safer convictions. Defensive properties. Preferred sectors include net lease, self-storage, residential, specialty, and healthcare. One of our main lessons from the Great Financial Crisis is that increasing exposure to more defensive sectors and taking profits off highly cyclical companies needs to be done early while the market is still hot. In a recession, almost every equity sector loses in value, but there is a huge difference in magnitude, with some sectors getting absolutely crushed while others only have limited volatility throughout the cycle. For instance, hotel REITs lost 60% in 2008. During the same year, healthcare REITs only dropped by 12% because their cash flow was significantly more resilient to economic shocks. 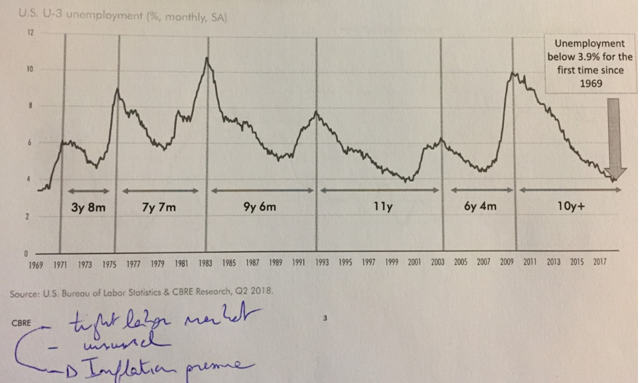 Taking some chips off the cyclical hotel REITs in 2005, 2006, or 2007 and reinvesting proceeds in more defensive healthcare REITs would have been prudent and greatly reduced the pain ahead, but the fear of "missing out" on the rapid gains of hotel REITs late in the cycle blinded so many investors. Storage: 5% total return in 2008 while the S&P 500 (SPY) lost 37%. Healthcare: minus 12% total return in 2008. Net Lease: minus 15% total return in 2008. Self-Storage: demand is very inelastic to economic conditions. In fact, in a recession, the demand may even go up as people downside to smaller homes and need storage space for all the extra stuff. Healthcare: similarly, the demand drivers do not change materially in a recession. People will still get sick and need medical facilities to get treated. Net lease: the strength of net lease properties is mostly in the exceptionally long lease terms of up to 10-15 years that protect the landlord in a recession. The price has nicely recovered since then, and we are now waiting for another sell-off to buy more when new capital comes available. As we approach the end of the current cycle, we favor REITs with long lease terms that guarantee high rent payments for years to come. Essential Properties is a good example here as it enjoys up to 10-year long leases with annual rent increases with the majority of its tenants. Moreover, its tenants operate in recession-resistant sectors and are very profitable with 2-3x rent coverage ratios. As such, even if we went into a recession tomorrow, we would not expect the cash flow or the dividend to drop materially, if at all. 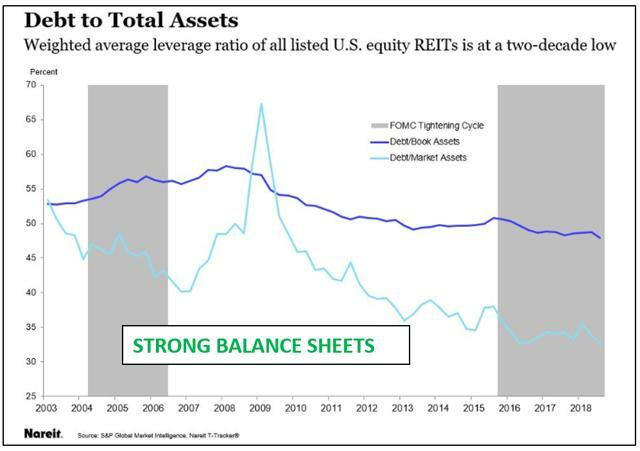 This is, however, on "average", and we find enormous disparities in balance sheet strength between different REITs. Today is not the time to be overly aggressive, and we rather invest in REITs with strong balance sheets and/or a near-term focus on deleveraging. In total, close to 50% of our portfolio is allocated into more defensive sectors (self-storage, net lease, healthcare) and/or REITs with long lease terms and strong balance sheets - affording greater stability and safety to our portfolio. To target even greater downside protection, we chose to follow a "value" approach - seeking to invest in REITs trading at low valuations and higher dividend yields that are backed by low payout ratios. In this sense, we do not rely on aggressive growth assumptions to generate attractive total returns. Our holdings are valued at just 9.47x FFO with pessimistic assumptions of zero to little growth going forward. We believe that the "already" negative market sentiment may help us to minimize downside in the next market downturn since the valuations are already at historically low levels today. 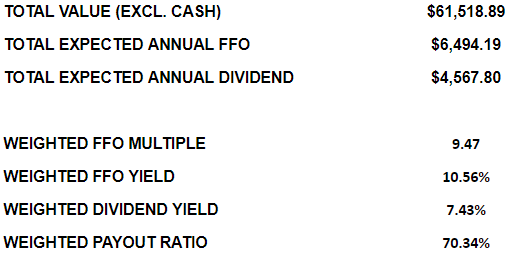 Moreover, since our dividend yield is a hefty 7.43% - backed by a safe 70% payout ratio, we expect the majority of our dividend income to be sustainable even in a recession. Generating returns through high dividends feels much safer at this point of the cycle rather than targeting more appreciation in a potentially stretched marketplace. Heading into 2019, it is important to limit risk exposure and focus more on quality names rather than the more speculative positions. Spirit Realty Capital (NYSE:SRC) is a defensive net lease REIT with a fortress balance sheet, long-term leases, quality tenants, and yet it trades at just around 11.7x FFO and pays a safe 6.4% dividend yield. As the market becomes increasingly worried about a future slowdown of the economy, we expect this type of REITs to strongly outperform. Our Portfolio is today mostly invested in such defensive, yet undervalued and high-yielding companies as we prepare for the inevitable downturn that is likely to take place in the coming years. Want to Know Our "Top Picks" in This Late Cycle Economy? If you are looking to expand your real estate investments in 2019, take action now and find out why over 250 investors follow the "High Yield Landlord" approach to real estate investing. For more information click here. Disclosure: I am/we are long EPRT; WPC (ALL STOCKS IN CORE PORTFOLIO AT HIGH YIELD LANDLORD). I wrote this article myself, and it expresses my own opinions. I am not receiving compensation for it (other than from Seeking Alpha). I have no business relationship with any company whose stock is mentioned in this article. Additional disclosure: This article along with a 5-part series highlighting "The Best REITs To Own in Late Cycle" was published to subscribers one month ago.